As the President-Elect of AIEA and the 2007 AIEA Conference Chair, I am issuing this call for conference session proposals. Reserve the dates of February 18-22, 2007 for the Annual Conference of the Association for International Education Administrators (yes, this means the conference is being held over President's Day this year, with the conference starting on Monday, February 19 and ending Wednesday, February 21 with Advocacy Day on Thurs Feb 22). We will be meeting at the Marriott Metro Center in Washington, DC. The theme for the 2007 program will be The Global University: Challenges and Opportunities. We are planning a provocative, wide-ranging, and rewarding annual conference and we look forward to your participation. The conference theme speaks to the challenges and opportunities facing us as Chief International Education Administrators (CIEAs) as we embark on a path to achieve global competence within our colleges and universities. Furthermore, as CIEAs, we also have many operational concerns. Therefore, this request includes opportunities for proposals to be submitted on operational issues related to our positions. We want to encourage smaller group interactions and hope to receive proposals for roundtable discussions among members on issues important to CIEA positions. These small group interactions could be at different tables at lunch or during the regular program session times. We will also try to develop breakout sessions following specific plenary presentations. We also invite you to submit proposals for more substantive half and full day pre-conference workshops. In addition, we will provide an opportunity for Instant Issues Sessions defined at the conference by those attending. So, come expecting to participate even if you are not giving a formal presentation. Please provide proposals for sessions as outlined above. These can take the format of pre-conference workshop, panel discussion, research presentation, roundtable discussion, or poster session. 1. Global Partnerships: Establishing branch campuses abroad, global institutional partnerships/relationships including dual or joint degrees, and international internship opportunities. We are particularly interested in presentations addressing the pros and cons associated with global partnerships. 2. Rethinking the Relationship with Academic Units: Are there good models of working with deans, department chairs, and faculty to achieve the goal of internationalizing our campuses? 3. Foreign Languages in the Global University: What are the best ways to ensure that all students regardless of their discipline have access to foreign language learning relevant to their educational and career goals? What are the pros and cons associated with foreign language departments overseeing the instruction of foreign languages to students not majoring in foreign language and literature disciplines? 4. Study Abroad: Meeting the Lincoln Commission’s Challenge: The Lincoln Commission report has called for a goal of 1 million college/university students study abroad annually by 2016. To reach this goal will it require that our institutions abandon the model of assessing a study abroad user fee and move to a system by which the costs to operate a study abroad office and to provide study abroad fellowships come directly from tuition revenues or general student fees? How are we to address the movement by some colleges and universities to restrict the numbers of students applying to programs operated by third party providers especially when it involves the use of an institution’s fellowship/scholarship funds for programs not directly operated by that institution? 5. Global Competence and Assessment: The survey results from the 2006 AIEA conference indicated significant interest in exploring further the topics of creating and implementing comprehensive and coherent international plans for our campuses and developing means to evaluate and assess the extent to which are institutions are internationalizing. We are particularly interested in presentations focusing on best practices. As Vice President/President Elect of AIEA and the 2007 conference chair, I encourage you to organize presentations and/or sessions on the topics listed above or on any other innovative topics and issues related to international learning, leadership, and public engagement. If you wish to have a pre-conference workshop or session proposal considered, please complete the proposal form and submit no later than September 30, 2006, earlier if possible (by July 1 is strongly encouraged), using the submission format which appears as a link on the conference website. We will then review all submissions and respond regarding acceptance or not. We will also ask for detailed information on final session plans including persons presenting or responding, as well as a final abstract. Sessions are 75 minutes long so please limit panel proposals to three presenters to allow time for discussion. Participants are encouraged to be innovative and thought-provoking in their design of the session and should consider alternatives to the traditional reading of papers and panel discussions as appropriate. If you wish to submit a workshop or session proposal, please provide all of the information requested in the submission form. Email submissions of proposals or other email correspondence should be sent to me, William Brustein at [email protected]. Dr. Fukuyama, professor of International Political Economy at the Nitze School of Advanced International Studies at Johns Hopkins University, has published widely on issues concerning political and economic development. His most recent book America at the Crossroads: Democracy, Power, and the Neoconservative Legacy has just been published by Yale University Press in March 2006. At the 2007 AIEA conference, Dr. Fukuyama will be speaking on "American Foreign Policy and American Education." The 12th President of Monterey Institute of International Studies, Dr. Clara Yu was born in China, and educated in Taiwan and the United States. She holds a BA degree in English from the National Taiwan University and a PhD in Comparative Literature from the University of Illinois. She has taught at the University of Maryland and Middlebury College and served as a consultant in artificial intelligence in the Washington DC area. A frequent speaker at conferences on higher education, Dr. Yu has served on technology task forces and consulted for educational institutions in the US and abroad. Her extensive list of scholarly publications covers a wide array of subjects including information technology, liberal arts education, language pedagogy, natural language processing and artificial intelligence, international studies, Chinese literature and Chinese culture. Charles Kolb is President of the Committee for Economic Development (CED) with offices in New York City and Washington, D.C. CED is an independent, nonpartisan organization of 250 business and education leaders dedicated to economic and social policy research and the implementation of its recommendations by the public and private sectors. He has held this position since September 1997. Prior to joining CED, he served as General Counsel and Secretary of United Way of America from 1992 to 1997. During nearly ten years of government service he held several senior-level positions. He served as Deputy Assistant to the President for Domestic Policy, The White House (1990-1992). At the White House, he worked on several domestic issues involving economic, education, legal, and regulatory matters. From 1983 to 1990, he held three other government positions: Assistant General Counsel, Office of Management and Budget (1983-1986); Deputy General Counsel for Regulations and Legislation, U.S. Department of Education (1986-1988); and Deputy Under Secretary for Planning, Budget and Evaluation, U.S. Department of Education (1988-1990). **NOTE: If you are a CURRENT AIEA MEMBER, you received an email with a separate member link for the conference registration which enables you to receive member pricing. Do not use the link on this page ifyou are a current AIEA member as it will only provide you with non-member pricing options. Online Registration ends January 19, 2007. After that date, it will be possible to register onsite for an additional $50 fee. There will be no penalty for cancellations received on or before January 15, 2007. The full amount paid minus a $40 fee per registration will be refunded. No refund will be issued for cancellations after January 15, 2007. Late requests for refunds due to a family emergency only will be considered on a case-by-case basis. AIEA is not responsible for problems beyond our control such as weather conditions, campus conditions, travel difficulties, etc. No refunds will be given in these situations. Core Competencies for International Education Leadership: What Do We Need to Know to Do What We Do? Evaluating Graduate Programs in International Education: Whose Standards? What is AIEA’s Role? Thank you for considering the opportunity to exhibit at the 2007 AIEA Conference in Washington DC. Several hundred senior-level leaders in international education from across the US and the world will participate in this conference. These leaders and professionals recognize the benefits of networking with organizations in the promotion of international education on their campuses. Exhibitors have the unique opportunity to share information about their organizations with these senior-level leaders and key decision makers. Only a limited number of exhibitors will be selected for the AIEA conference in order to maximize exhibitors' time with conference participants. All conference breaks will be held in the exhibit area, so as to maximize interaction time. To be considered for one of the limited exhibitor spots at the AIEA conference, please download this special exhibitor registration form (No longer available) and submit it to AIEA. Please note that Exhibitor Registration does NOT include participation in any other part of the conference, which requires separate conference registration. Exhibitors will set up on Monday evening, Feb 19, 2007. Exhibits will be open to attendees on Feb 20 and 21. The opening ceremony is Feb 20 at 10 am. Take down will start at lunch on Feb 21. Please leave exhibits up through 12 noon on Wednesday Feb 21. Download exhibitor logos by clicking here. Become a sponsor at the 2007 AIEA conference and raise your visibility with senior-level leaders in the international education field! Sponsorships of varying levels are excellent marketing and public relations opportunities for sponsors to promote their organizations to senior level leaders in international education. 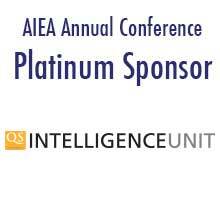 Sponsors receive high visibility at AIEA conferences, including in the conference program and on the website and during special conference events. Larger commitments also include complimentary conference registrations. To become a sponsor and for more information, click here (No longer available). Click here to download sponsor logos. Participants will gain an understanding of how to develop international learning outcomes and a plan for assessing them by engaging in activities to think through these processes. Presenters will share good practice in assessment, challenges in articulating outcomes, and lessons learned in implementing assessment. The U.S. government has recognized the value of study abroad through recent appropriations which stress the strategic importance of foreign language instruction and of nontraditional destinations. This workshop will address the implications these initiatives will have on campus policies. CIEA 101 is a primer for newly appointed or aspiring Chief International Education Administrators. Experienced CIEA’s will deal with internationalization of a campus, resources, and political, leadership, and managerial roles of the CIEA, as well as the transition necessary from study abroad, ESL, or international student work to this position. Discussion of Cultures and Languages Across the Curriculum (CLAC) in the context of FL education and campus internationalization. Participants will walk away with ideas for implementing CLAC in various campus contexts and information regarding benefits of consortium membership. Click here for a link to the powerpoint. Click here for a link to the handouts. Click here for a link to Dr. Krutky's handouts. This session offers a common sense approach to fundraising for major gifts. Redefine familiar terms like fundraising, donation, and solicitation. Share philosophical and practical thoughts about development, concluding with a quick tour through the development cycle. We will also cover the Cycle of Successful Development. In addition, we will discuss personality traits and characteristics that will help you and others be most effective in raising major gifts. Bring your questions and expect a lively discussion about topics that are of most concern to you.